British Paralympian Sophia Warner has launched a mass-participation event aimed at encouraging those with disabilities to get into sport. The Superhero Series allows disabled and non-disabled people to take part in triathlons - either solo, or in a team. "As a person with a disability looking to do sport for fun I've found it a real struggle," Warner said. "I know what a positive impact sport can have on a person's life - I believe everyone should have the chance." The former T35 sprinter - who has cerebral palsy - became the first disabled person to enter the London Triathlon back in 1998. "Even as an elite athlete I found it hard to keep up and had to ask other participants for help with my wetsuit and to get my bike down from the bike rack," she continued. "I've also taken part in fun runs where the roads have reopened and organisers have started clearing up before I've had a chance to finish." 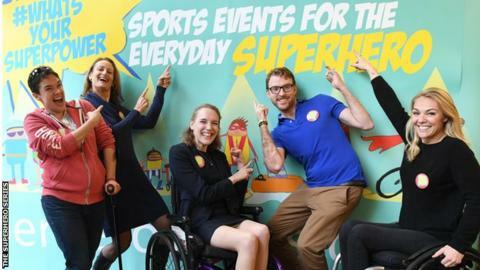 The Superhero Series is described as being "dedicated to the everyday superhero - the UK's 12 million people with disabilities - and their friends and families". World Championship medallist Warner added: "The idea is simple: to create fun, gutsy events where people with disabilities call the shots and don't have to worry about cut-off times or equipment restrictions. "If you need flippers or floats in the water, or want to use your powered wheelchair, we make it possible. "In fact, as far as I'm concerned, anything goes." Entrants can choose to do the whole triathlon or just one or two stages as part of a relay with disabled and non-disabled family and friends. There are three triathlon distances to choose from and all disabled participants are invited to bring along a free "sidekick" to assist them in completing the course. "We've gone all out to try to think of everything we can to ensure everyone can be a superhero for the day," Warner said. There is also the chance to compete as part of a celebrity team alongside the likes of Rio cycling and athletics Paralympic medallist Kadeena Cox or Channel 4 TV presenter Sophie Morgan. The 20 "celebrity captains" for the event will choose two athletes each to make up a team, with entrants asked to submit reasons they should be selected. How have Paralympics changed Brazil? Read more on Paralympics: How have Games changed Brazil?